When Col. William M. Smith, at the behest of the Don Ignacio Martinez heirs, needed a surveyor in 1849, he was fortunate in that Thomas A. Brown had recently located in Contra Costa County. Brown, at that time a 26-year-old engineer, took on the job of surveying and plotting 120 acres of land west of Alhambra Creek for a fee of $2500. Five years earlier, he had done a similar job in Oregon Territory where he had laid out the city of Portland. Following his education in Missouri, where his family had moved when he was 14, he had at 20 joined a wagon train to Oregon in May of 1943. News of his Father, Elam Brown's, having emigrated to California, brought him on a visit in early 1847 to Mission Santa Clara. Finding California to his liking, he returned to Oregon to close out his affairs. While making preparation to return to California, word of the discovery of gold in the foothills reached him. He determined to go directly to the mines, but the vessel bringing him from the Northwest encountered bad weather and he reached the Bay Area too late to go immediately (to the Sierra mines), spending the winter at Mission Santa Clara. Early in 1849, he did go to the mining country but returned to Contra Costa where he was hired for the surveying task. Following the Martinez assignment, Joseph Swanson, agent for the William Welch(1) heirs, hired him to continue surveying on their land, between 500 and 600 acres east of (Alhambra) creek. This was to be a profitable undertaking, for he received nearly one-third of the land surveyed as payment for his services. According to the Alcalde's book of the time, he owned every other block in the downtown section of that survey plus large acreages in the outlying areas. Much of the land from Susana Street to Brown Street was his. In partnership with his brother, Warren Brown, and brother-in-law, Napoleon B. Smith, he established a trading post, the only business enterprise in the county. This was near the corner of Alhambra (then Smith) and Green Streets, a business they sold within the year. 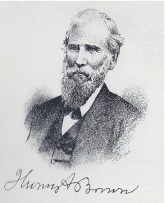 Brown was appointed Alcalde of the territory in 1849, and with the formation of the county in 1850, was elected first County Clerk and Recorder, an office held until 1855 when he retired to become county supervisor. While he was County Clerk, he took up the study of law and was admitted to practice in 1855. He became a county judge in 1856, serving until he was elected to the (State) Assembly in 1864, serving two terms. Practicing law in Martinez, he was appointed county judge on the death of Judge Lander in 1874. When the Superior Court was created, he became the first Superior Court Judge. A family man, Brown had married Caroline Cameron in 1851. She was the daughter of Methodist minister, the Rev. John M. and Polly Cameron, who had come across the plains in 1850 and settled in Martinez. Rev. Cameron had built the first brick house in the area, a comfortable home on the corner of Las Juntas and Green. In 1851, at 17, Caroline married Thomas. They built their home, a brick structure, just north of the creek near the present site of the old State theater(2). Their second home, a frame house with yard and gardens fronted on Las Juntas near Main. Three sons were born to the couple, Elam C., Byron, and Wallace. Brown served the Superior Court until shortly before his death in 1889, having suffered a severe stroke. There was controversy at the time with his sons protecting him from the storm of public outcry and letters to the editor of the Contra Costa Gazette that he be removed from the bench, being so seriously impaired. He finally resigned just weeks before his death. Brown Street(3) is named for the family. William Welch was a Scotsman who jumped ship in Bodega Bay in 1821 to remain in California. He married Maria Antonio Galindo and applied for a grant of land in 1832 from Mexican authorities. It extended from the strait on the east side of Alhambra Creek almost to what is now Walnut Creek. Because of poor health and Indian hostility he did not live there but established a headquarters near the Walnut Creek boundary of his property. It is also said that he built a corral and holding pens for his cattle operation near the present site of the Martinez Museum. He is thought to have died in 1846. His family then moved to the Walnut Creek site. (Charlene Perry, Martinez: A California Town, 1986 page 2). State Theater: a 'movie palace' of the golden age of Hollywood, it was built in the early 1920s by Martinez Mayor J. J. McNamara, a local contractor. Located at the corner of Ferry and Ward Streets, it sat empty and moldering for many years until bought, rehabilitated and turned into the offices of the Contra Costa County Public Defender. Brown Street is one of the few streets to traverse uninterrupted the east/west axis of the town from Berrellesa to Court/Pine and Pacheco streets. To the south lay the hills that for 60 years served as the site for the Christian Brothers seminary and winery. To the north, just east of Alhambra Creek is a hill known as Brown's Hill until the Martinez community passed an $800,000 bond to build Martinez Junior High School. The school opened in February, 1931.